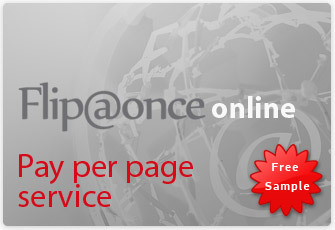 Flip@once on line is a pay per page service for the creation of on line electronic flipping books. Convert your pdf documents and many other formats into on line electronic books. Then, add links/contents, sound, streaming video, search facilities before you publish on line. Alternatively create an autorun CD-ROM multimedia presentation. Send us your pdf and get a page flip digital book demo for free. Flip@once desktop is a stand alone - unlimited use - Windows software for the creation and management of multiple interactive digital documents. Impressive digital page turning software that converts any PDF file into stunning presentations.Save printing costs and quickly create a digital flash book with page turning effect and interactive content. 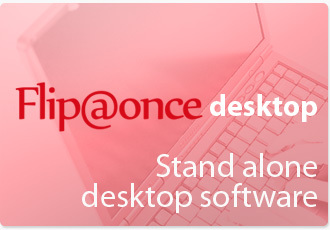 Download Flip@once Desktop page flip software.